Lekshmi Kumar, MD, medical director of Emory Emergency Medical Services, received the EMS Medical Director Award at the Georgia Region III Emergency Medical Services banquet at Emory Saint Joseph's Hospital. 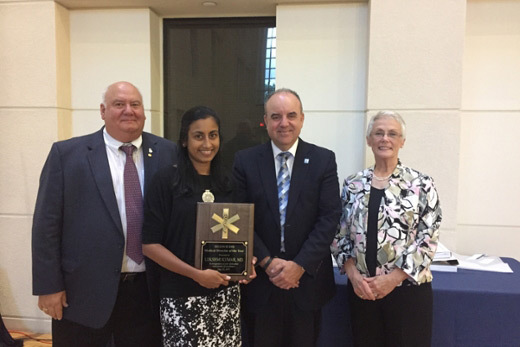 Emory Emergency Medical Services (EEMS) earned top honors at the Georgia Region III Emergency Medical Services banquet, presenting Rachel Barnhard with the EMS Director of the Year Award, and Lekshmi Kumar, MD, with the EMS Medical Director Award. Hosted by Emory Saint Joseph’s Hospital, the Region III banquet presents annual awards to the top EMS professionals and programs in eight counties throughout metro Atlanta. Region III is one of ten regions in the state operating within the Georgia Department of Public Health’s Office of EMS and Trauma. Barnhard is the director of EEMS, a student-operated emergency medical service providing medical care to Emory University students, faculty, staff, visitors and the surrounding community. EEMS was established in 1992 and became the first licensed collegiate medical first responder service in the state of Georgia. Barnhard was presented with the EMS Director of the Year award for her leadership and contributions to the development of pre-hospital medical care in the community. This includes working with the EMS Recommendations Work Group for the state of Georgia, as well as a subject matter expert, developing plans, policies and recommendations on EMS data collection. Barnhard also works in critical event preparedness with local schools, public safety and federal government agencies. Kumar serves as medical director for EEMS, and is also an assistant professor of emergency medicine at Emory University School of Medicine as well as an emergency medicine physician for Emory Healthcare. She was presented with the EMS Medical Director Award for exemplary service benefitting and supporting Emergency Medical Technicians, physician practitioners and patients. Kumar’s commitment to high quality medical care includes providing guidance, leadership and quality assurance in the role of medical director to four different services: Decatur Fire Department, American Medical Response (Dekalb), the Publix Georgia Marathon and the Sandy Springs Fire Rescue Department. In prior years, Region III awarded EEMS the EMS Service of the Year, EMT of the Year and Medical Director of the Year, and the organization has also garnered national recognition among collegiate-level peer services. Region III banquet participants at Emory Saint Joseph’s also included speaker Julio Lariet, MD, assistant professor in the Emory Department of Emergency Medicine; and presenters Matthew Keadey, MD, chief of service and medical director of Emory University Hospital Emergency Services; and Bryan McNally, MD, associate professor of emergency medicine at Emory University School of Medicine.